The phenomenon around playing an entire album, track by track, on stage has been around for a while. For cover and tribute bands, it’s become the equivalent of karaoke night, a chance to exhibit their fidelity to a chosen idol. Lately, we’re seeing more of the actual idols doing that very same thing: playing their iconic LPs live, note for note. Some “legacies,” as classic artists are now often referred to (“heritage acts” is another gentle sobriquet) are now basing entire tours on the premise of start-to-finish renditions of classic albums, such as Peter Gabriel’s So, Paul Simon’s Graceland and The Miseducation of Lauryn Hill by the ex-Fugees member. The irony here is the idea of artists who have been worshipped by tribute bands throughout most of their careers — Dread Zeppelin, anyone? Proxy Music? Nearly Dan? — are now being put in a position to compete with them. And more ironic is that, without naming names, many of those tribute bands nail those hits better than the original version can now, as age and decades of recreational pharmaceuticals have knocked an octave or two off the vocals and a bit of velocity off the fingers of the left hand. There’s only so much magic you can conjure up in real time from the FOH console to compensate for that. What’s on those tribute stages is increasingly edging into the territory of Beatlemania, that seminal 1977 Broadway show whose tagline “Not The Beatles, But An Incredible Simulation!” seems at once clinical and quaint. Many, if not most, of the big bands have few of their original members left. The Doobies have more than most, with Tom Johnston, Patrick Simmons and John McFee on board, though as a percentage of the band’s dozen or so foundational members, at about 25 percent it’s still fewer than the actual Beatles’ current availability. Last night I had dinner with a friend who will be heading out this summer as the guitarist for Humble Pie. The first record he ever bought as an 11-year-old was Frampton Comes Alive. In a very American take on capitalism, the brands are outliving the bands. That’s all good for live music, and especially for rock music, which has been struggling lately — even Greta Van Fleet has to contend with being regarded as much as a tribute to Led Zeppelin as being their rightful heirs. It’s also going to help keep the existing touring infrastructure well lubricated for years, and possibly decades, to come. It will serve as a bridge between the massive touring ensembles that the top pop acts will always need to bring their “experiences” across to top-dollar ticket holders and the exploding mass of singles and duos that are turning everything from subway platforms to hotel lobbies into performance spaces at a time when the club circuit is under real estate and other economic pressures. In addition, in a way, this is also presenting the live-music industry with a bit of a curatorial responsibility. Think of all the multiplatinum live albums, from the aforementioned Frampton double LP to Jackson Browne’s Running On Empty to Bob Seger & The Silver Bullet Band’s Live Bullet to Jimi Hendrix’s Jimi Plays Monterey and The Who’s Live At Leeds, which created a beautiful, magnificent synergy between stage and studio. The LP reproduced live on stage, by its creators or their acolytes, may be the last link left to that. The technology is there to make that happen. Tracks made from stems distilled from original recordings can bring original elements to the stage show — critical backing vocals or instrumentals by performers no longer able to perform — and DSP can recreate Abbey Road reverb chambers or Wurlitzer electric pianos that can no longer survive constant touring. Taking it to its logical extreme, we could even see holograms of performers who’ve already passed on, performing live with their survivors, something music videos once took on (Natalie and Nat King Cole, Elvis and Lisa Marie Presley, Bob Marley and Lauryn Hill, et al.). The possibilities are endless, so don’t let the afterlife stop you. I’m being a bit facetious here, but mostly I’m being quite earnest: using live performances to keep the idea of the LP, which was the cornerstone of the music industry’s economics for a half a century, alive and well. In fact, the idea could help reinvigorate the notion of the live album, which was a staple of the business for decades until it fell out of favor in the 1990s. There have been a few notable ones since then, such as Daft Punk’s Alive and The White Stripes’ Under Great White Northern Lights, both from back in 2007, and a few others from R.E.M. and My Morning Jacket, but they lead an otherwise sparse pack. If this is indeed the age of live music (at least for another few years), what better time to bring back the live album? And how much more meta can you get than an artist doing a live LP onstage of one of their LPs? You’re welcome! 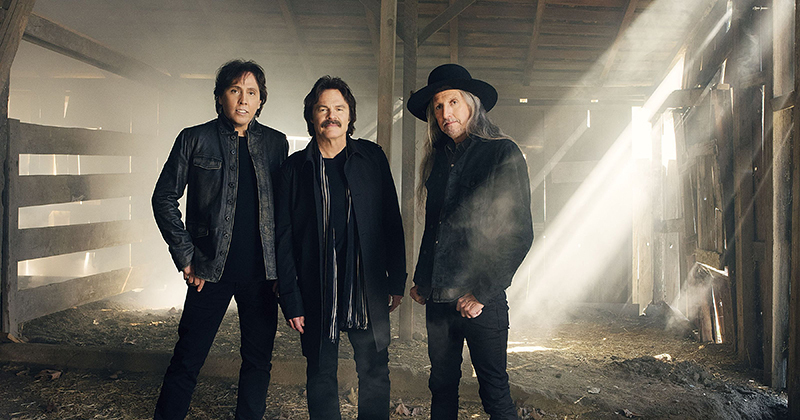 Photo Caption: From left, John McFee, Tom Johnston, Patrick Simmons and the rest of the Doobie Brothers perform their classic Toulouse Street and The Captain and Me albums in their entirety on two nights at New York’s Beacon Theatre. Photo by Andrew McPherson.